Cars 3 is enjoyable by all ages, and when it’s over, you’ll look at the time and wonder how a movie could go by so fast. Disney-Pixar definitely knows how to make a family-friendly movie, loved by all members of the household. Let's all admit it. By the time a franchise is into its third sequel, the audience starts wondering if it's really worth spending the time and money going to see movie number three. It's a good thing that the writers and directors of Cars 3 are a step (or two) above other franchises because Cars 3 is going so fast, no one can catch up. "I am speed" is still the tagline of this franchise and rightly so. Come speed ahead with Lightning McQueen and some new friends into this new adventure- one that adults can clearly relate to- as our favorite racecar discovers a new purpose in life. Lightning McQueen (Owen Wilson; Zoolander) isn't doing so well in this racing season. He can't seem to keep up with his younger competitors and soon realizes that no matter what, he is just simply not as fast as newbie Jackson Storm (Armie Hammer; The Birth of a Nation), a more aerodynamic, younger model. (See the whole adult theme here?) After a crash sends Lightning back to Radiator Springs to recuperate, his friends sell their company- and sponsorship of 95 to a new team owner, Sterling (Nathan Fillion; Guardians of the Galaxy), who has a custom built training facility to assist our favorite speedster. Working with his new trainer, Cruz Ramirez (Cristela Alonzo; Angry Birds), a snappy little yellow thing, who always dreamed of being a racecar driver instead of just a trainer, Lightning slowly realizes that his choice doesn't have to be solely to race or not to race. Cars 3 is clearly a coming of age story that reverberates with those of us out who no longer play in the sandbox. The writing is well done – smooth and easy to follow and reminiscent of the writing style of the original Cars from 2006, which is not surprising, considering Disney-Pixar ensured that two out of the three writers had worked on the original Cars (Keil Murray and Bob Peterson). Mike Rich, the last member of the writing team, previously worked on Secretariat for Disney. Children of all ages will love it and hopefully, the lesson that being 1st place doesn't always mean we are a winner comes through subtlely, yet pleasing to the mind. Director Brian Fee, who directed the first Cars movie in 2006, brings his vision to the big screen once again, creating a solid movie- until you get to the last 15 minutes or so- and then, it simply takes off with Lighting speed. I was literally sitting at the edge of my seat waiting for the story to conclude. It's a simple yet powerful ending to a wonderful story. Disney-Pixar clearly leaves the door open for more movies in the Cars franchise with a new speedster on the track, Cruz Ramirez, may just have her own following, to make a fourth movie in the franchise successful. The Ultimate Collector's Edition comes with three discs. The first disc is the 4K UHD movie version. Presented in 2160p with an aspect ratio of 2.39:1, the picture quality is amazing. The High Dynamic Range produces brilliant colors- the red of Lightening McQueen pops like never seen before. The black and purple on Storm provide a dynamic contrast and the purple is a more intense color than seen on even the HD version. The metallic of the colors and color saturation just seem to pop on the screen. The picture has a crispness to it, eliminating any blurriness or distortions. When racing on the beach, you can see all the indentations of the tire tracks in the sand and the sand flying around. Clearly, the animation team did a spectacular job with all the fine details clearly seen on the 4K UHD disc. The audio for 4K UHD is presented in Dolby Atmos as long as you chose it beforehand, otherwise, it defaults to the Dolby Digital 5.1 track. The Atmos does provide a fuller feeling to the background noises and music than the Dolby Digital 7.1 on the HD Blu-ray disc. Clearly, in a theater utilizing Atmos, there is going to be a huge difference in sound, but in a home setting, it doesn't provide the "umph" we expect. Nonetheless, the sound quality is amazing and is still an improvement over the prior Dolby versions. Lou: A short animation about recess and lost and found items. Ready for the Race: Professional Racecar Driver, William Byron, talks about his career. Audio Commentary: Listen to Director Brian Fee, along with producers and Creative Director talk about their work on the Cars franchise. A 40-minute five-part feature Behind the Scenes, including the following: Generations: The Story of Cars 3; Lets. Get. Crazy. ; Cars to Die(cast) For; Legendary; and World's Fastest Billboard. Fly-Throughs: Explore digital elements, including Thomasville, Florida International Speedway, and Rust-Eze Racing Center. My First Car: The cast and crew discuss their first cars. Cars 3 is a 4 and a half star movie. It's enjoyable for all ages, and when it's over, you'll look at the time and wonder how a movie could go by so fast. Disney-Pixar definitely knows how to make a family-friendly movie, loved by all members of the household. Don't let the purchase of this movie go past the finish line without making its way into your home. 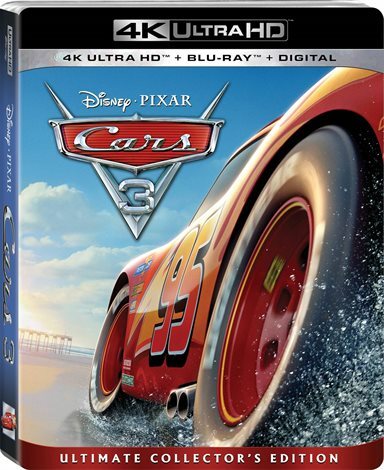 Download Cars 3 from the iTunes Store in Digial HD. For more information about Cars 3 visit the FlickDirect Movie Database.